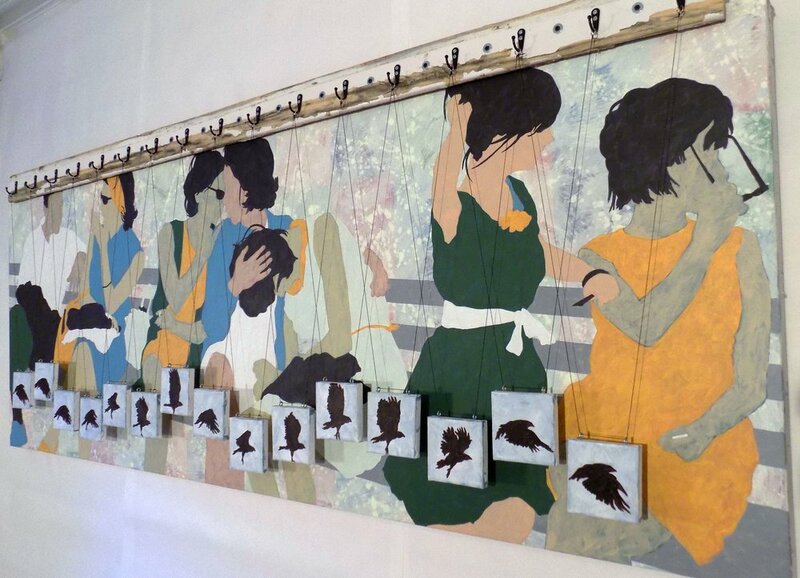 My mixed-media wall constructions and paintings combine a wide variety of styles, techniques and materials to create unique narrative works of art, each telling a story or dwelling on an expressive theme. 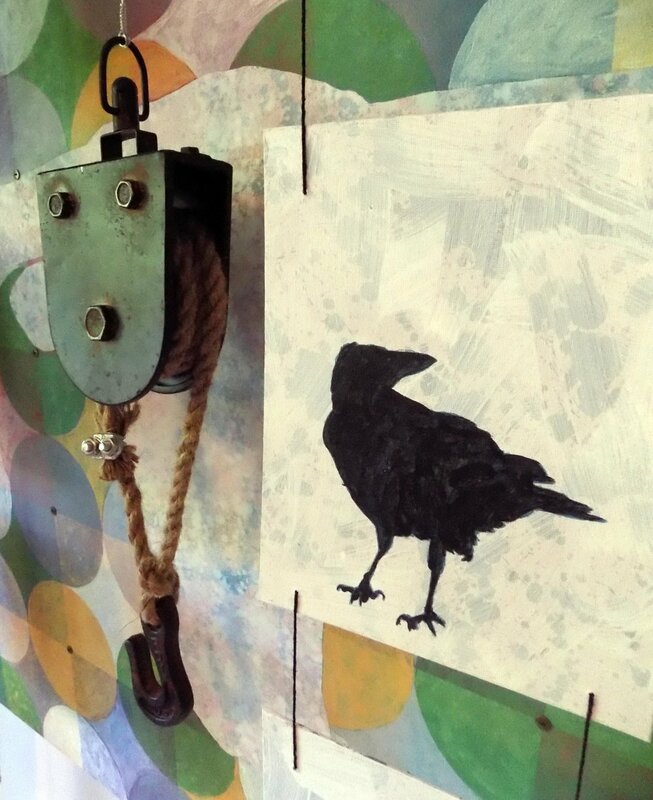 Painted images create a base for each piece, and the mixed-media process combines found objects with the painted canvasses, often featuring elements of light, the written word, and the material used to construct the artwork. 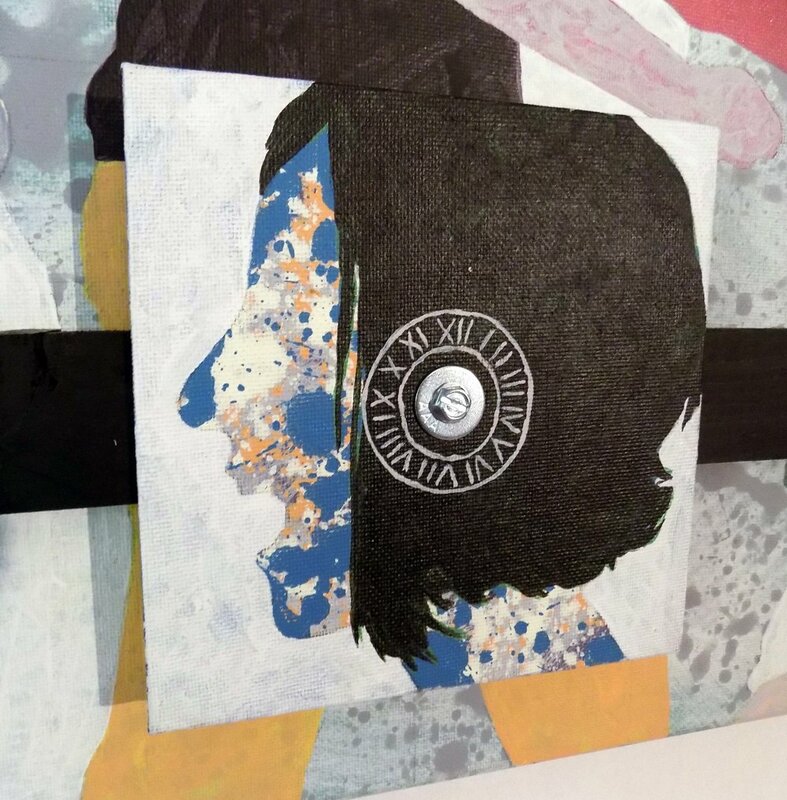 All of these elements combine to give focus to the artwork, as well as to round out the narrative impact of each piece. Featured here are some of my most recent and favorite pieces. Park Bench is a nostalgic piece about the common gathering places in our cities and towns. I intended this piece to be light, a sort of snapshot from a time in the last century. The bird flying across the face of the canvas are intended to enhance and focus the overall light and whimsical feel of the piece, and the muted color scheme evokes a more constrained time. American Buffalo is one of the first new pieces for a new body of work named Menagerie. All of the pieces in this body will feature animal depictions, but focus on issues separate, but enhanced, by the imagery. American Buffalo is a meditation on the the destructive nature of the American experience, such as the near total decimation of the iconic plains bison. 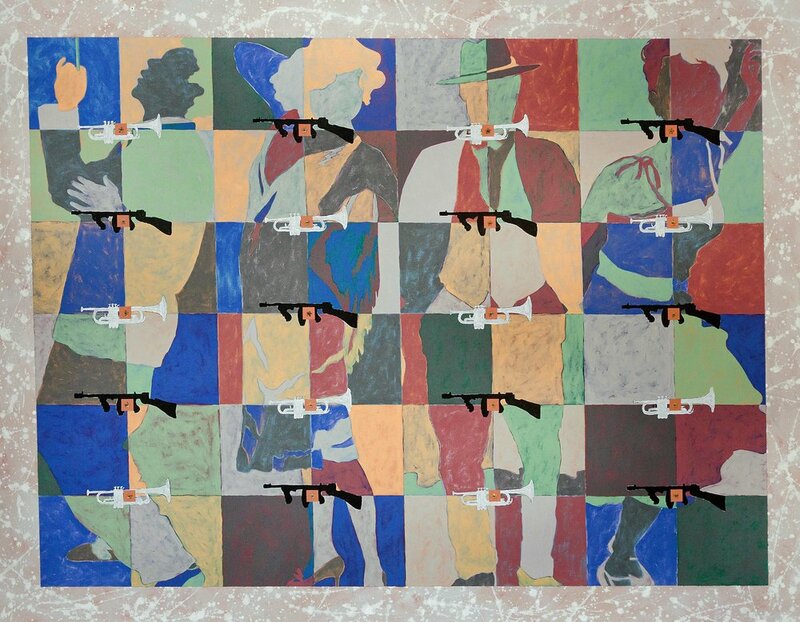 The men depicted are the Elaine 12, twelve black men who were arrested, tried and executed after the Elaine race riot in Arkansas in 1918, in which up to 600 black men were killed. People of color were disenfranchised and not allowed to serve on a jury in Elaine at that time, although blacks outnumbered whites in the area around Elaine by a ten to one ratio, and this event is considered by many to be one of the most egregious examples injustice in American history. The Crowd Series is composed of 12 works of art that contemplate two seemingly opposing facets of life in public - Strife and Secret. Strife can take on the overt form of people The works are displayed in alteration between the two themes, but each piece is a stand-alone work of art in it’s own right. To see more views and details of the work check out my Series page here. 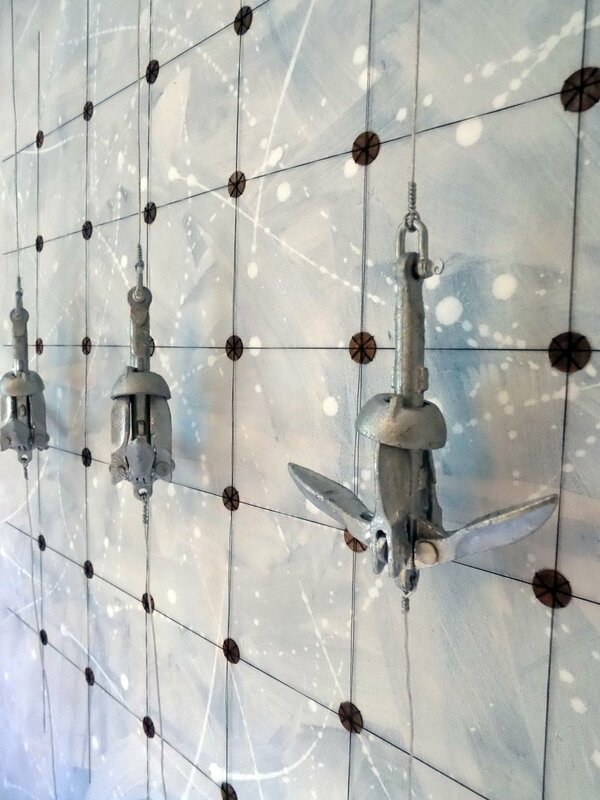 Originally inspired by the circular and square patterns of the irrigated fields as seen from the air, this piece is about the settlement of the American West. The image of the long horn steer symbolizes how the rise of the cattle industry developed along with the cultivation of the fields, and the crows elevated away from the canvas, along with the block and pulley, represent the darker aspect of European settlement - the dispersion and subjugation of the native people, now tenants on the ancestral land that they once stewarded. The Identity Series, comprised of two canvasses, is about how we define ourselves by the personal charms and totems thatwe collect. 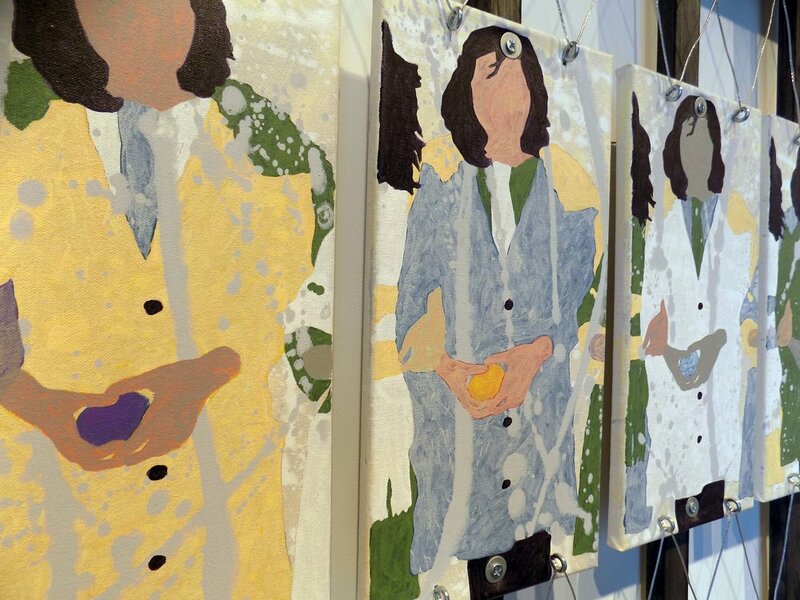 Each portrait is constructed with 25 canvasses hung together, each one painted in varying layers of color, with a small charm attached. Go to my Series page to see more views, details and explanations of the pieces here. The bombing of a concert in Manchester, England earlier this summer really affected me, as the attack appeared to target children and young women. My daughter, who is 11, would gladly have attended that concert, and the thought of any harm coming to her breaks my heart. 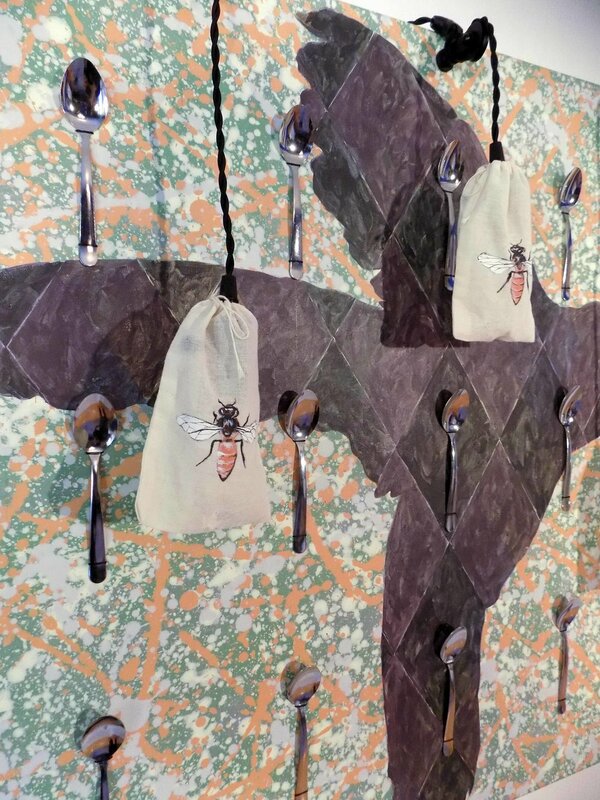 The bee imagery references the city of Manchester, which is known in England as the Bee City, and the bee became the symbol, across the city, of hope and defiance in the face of terror. 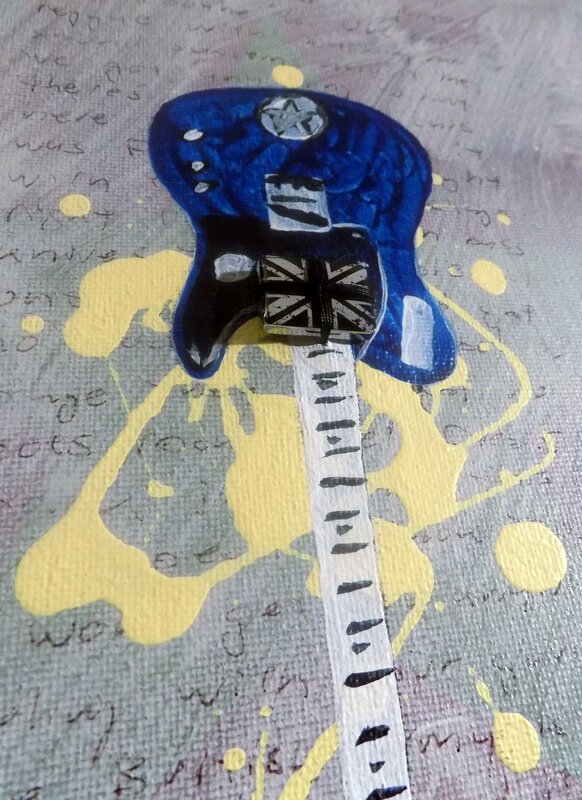 The guitar on the t-shirt represents Manchesters’ reputation as a center of music in England, and the shirt itself is one of my son’s, which has always been one of my favorites and which he has outgrown. There were 22 people killed in the bombing, and each person is represented by a glass bead hanging alongside the light, which for me illuminates the human cost of the tragedy and gives hope for the future. Sidewalk is a sort of homage to the morning commute, and the diversity of people all going in a single direction. The crowd moves fluidly in sync, but the individals are not connected, only overlap, each with his or her own agenda and attitude, whether they be walking with purpose and intiative, or seemingly sleepwalking through the day. 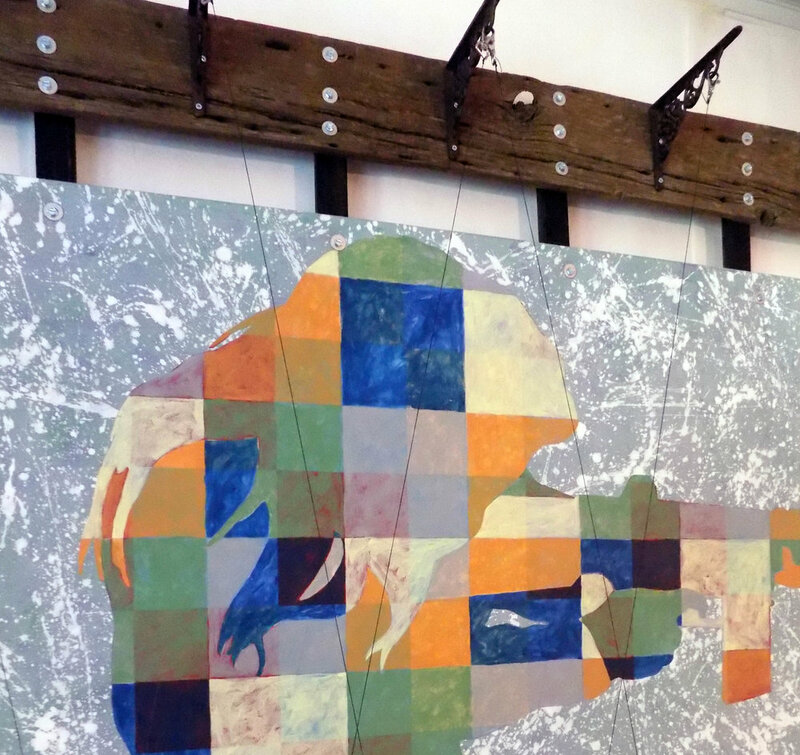 Against this backdrop, the piece is also about those who move upstream, away from the crowds. A few years back I became a stay-at-home dad, and this piece is almost nostalgic for me, a throw back to a time both purposeful and maddening. Cupid is a piece about duality, and finding love through adversity. 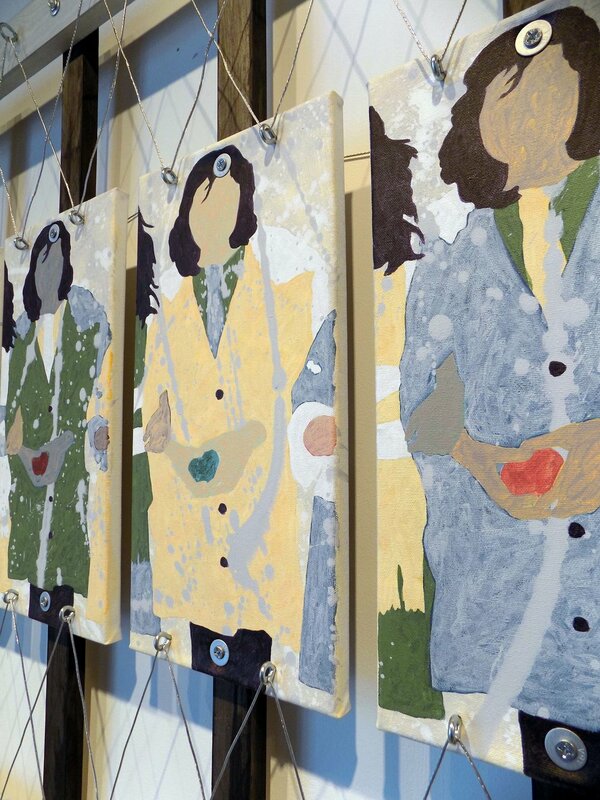 Both canvasses feature images of mixed race couples, a young couple just starting out and an older couple at the end of life. 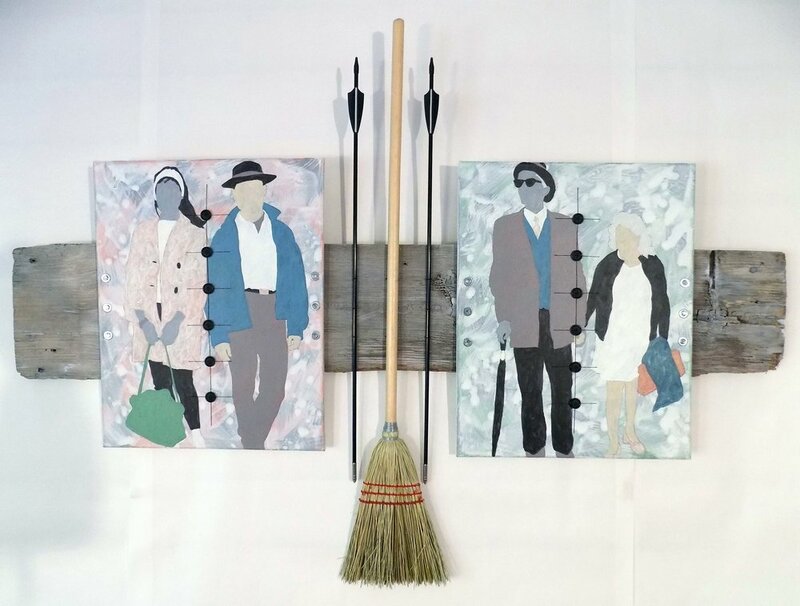 The broom separating the two paintings represents both the phrase “sweep you off your feet”, and also the African American slave tradition of “jumping the broom” as part of the mariage ceremony. 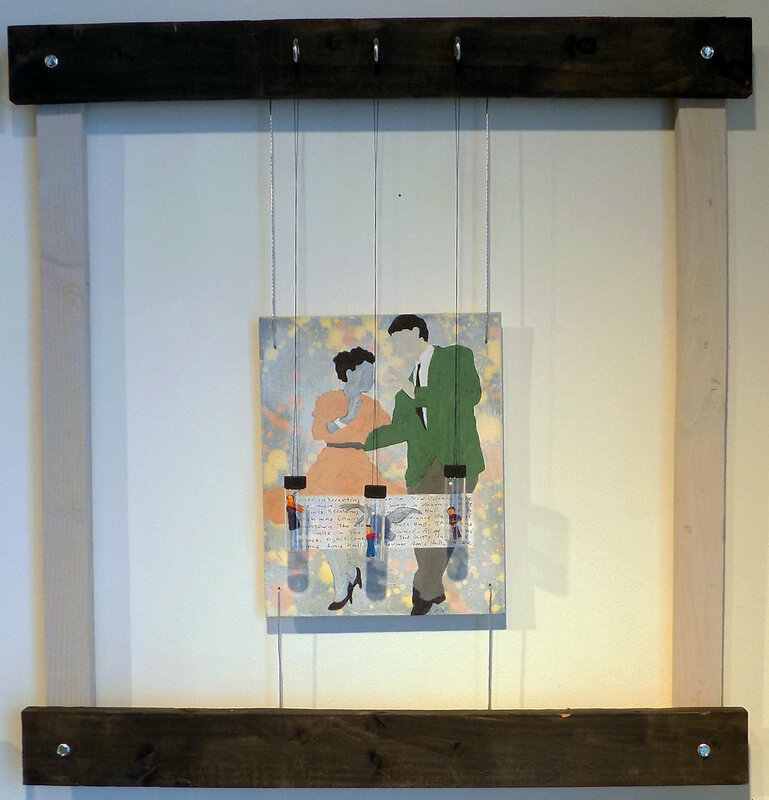 The arrows attached to the piece are a direct reference to the name of the piece, but also represents the hatred, violence and bigotry often endured by mixed race couples as they pursue love in an often-times intolerant society. 7 years ago, when my wife and I travelled to Belize for our anniversary, Tropical Storm Alex blew over our little island, before developing into Hurricane Alex in the Gulf of Mexico. I’ve been wanting to do a piece about Belize, and to pay homage to the wonderful local art and traditions of the region, so developed this piece as an homage to the country and a remembrance of the storm. I drew the colors for the piece from the toy lizards sewn to the canvas, and the large skull image is a reference to the deadly natures of tropical storms and hurricanes, as well as a nod to the sugar skull artwork, associated with Day of the Dead, that you see all over the island. Nectar is another of the first new pieces created for the Menagerie body of work. The colorful and energetic background is offset by the black washed hummingbird. 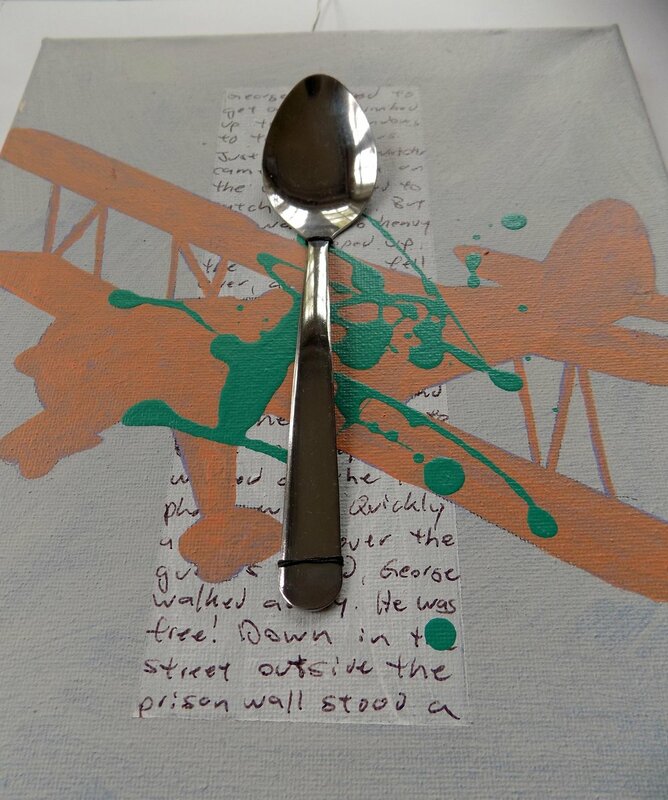 The spoons reference a spoon full of sugar, but also are intended as an acknowledgement of the issues of addiction. The hanging bags around the lights hold silver charms and needles. I wanted to create a piece about how children would stock an apothecary, given the ability to put in whatever they chose. As a parent of two kids, I know that glass beads, toy alligators, or worry dolls can all be employed to make a child feel better. The children in the central image behind the apothecary are playing ring-around-the-rosy, the old traditional English rhyme about the black plague, and the overall structure of the piece is intended to mirror the red cross. Hateful Intent elaborates on one of the pieces from the Strife series. In every society there are those that seek strife, that choose to vent their hate, that are filled with a desire to harm those who are different, disagree or displease them. Unfortunately, there is this darkness that hides in the light of life, not always visible, but consistently present. To resist it is to acknowledge and confront it, understand it’s form and drive it away. 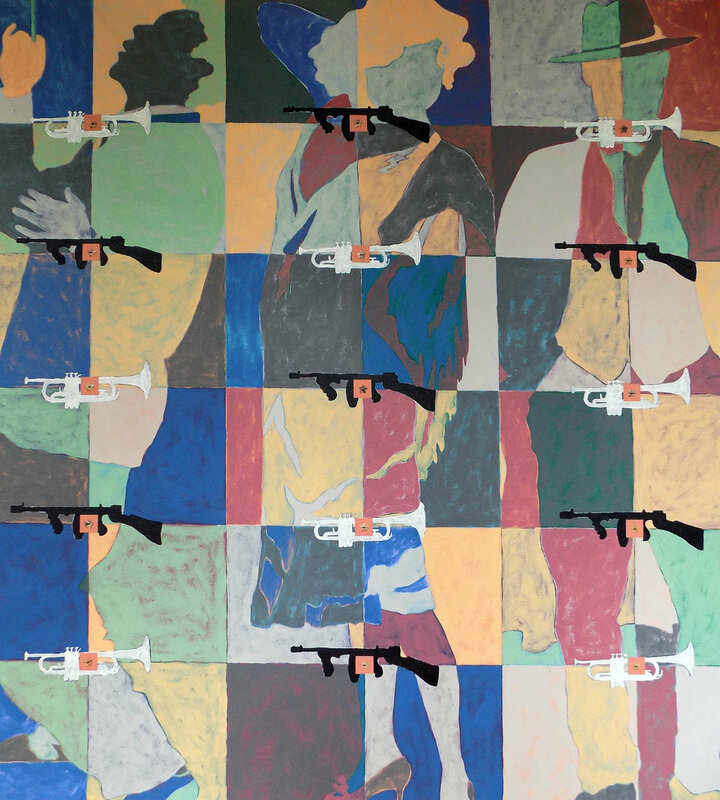 The Work Series is a collection of three canvasses depicting issues of states of work from the last century. Both Factory Girls and Teenage Sharecroppers depict children who were forced to work at the turn of the century to support their families. The three men in Idle Hands are out of work men in Louisiana during the thirties, at the depths of the Great Depression. Go to my Series page to get more detail and information on each of the three pieces in this series here. 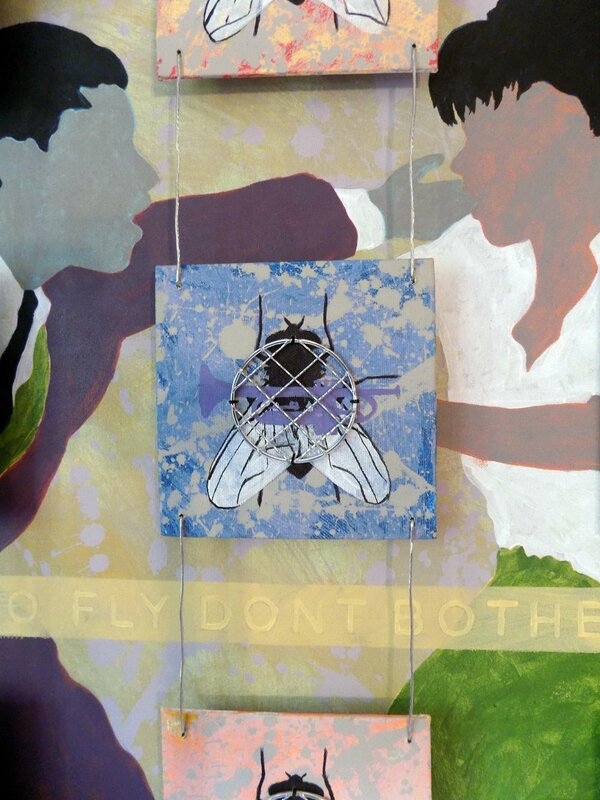 Boy is a companion piece to “Girl”, a work that I created for my daughter. 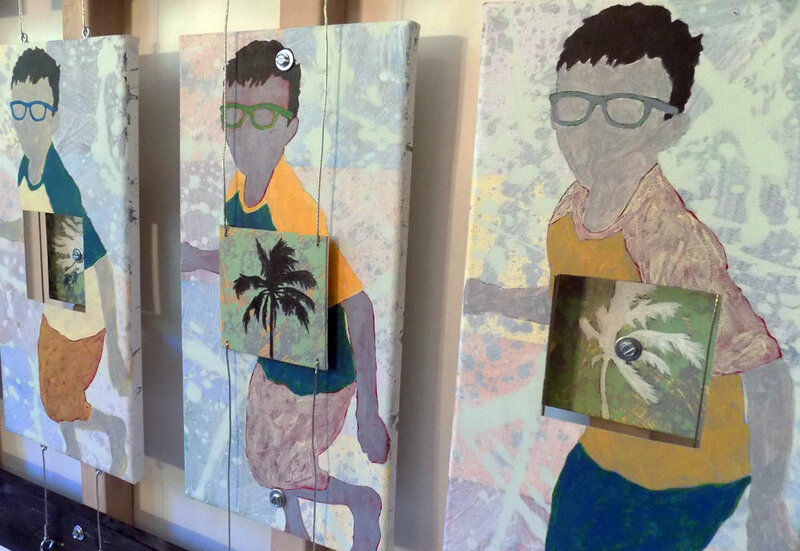 Boy features repeated images of my son, interspersed with palm trees, from a trip we took to Hawaii last year. I wanted to capture the energy and somewhat kinetic nature of the boy, so I opened up the color palate a bit and conceived the idea of alternating layers of canvas, hopefully getting at the joyous essence of what it’s like to be a seven year old boy. He is both on the beach, and the beach is in him. The central image of this piece is of a meeting between Winston Churchill, Franklin Roosevelt and Joseph Stalin in Yalta, on the black sea in the former USSR, toward the end of World War Two. 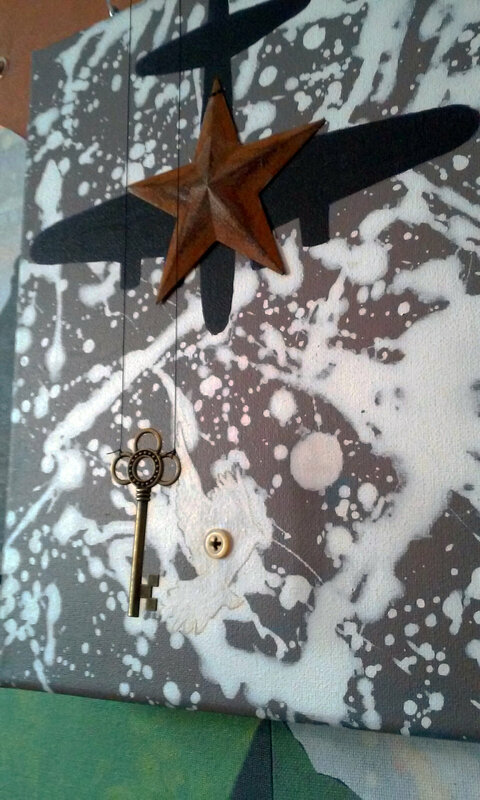 The bomber image on the small canvasses is offset by the small dove, a variation of the carrot and the stick, representing the conflicting impulses that are key to restoring order from conflict. The countries represented at the meeting, although pursuing varying and conflicting agendas before the war, needed to find a way to at least temporarily put differences aside to achieve a greater good, defeating a tyrant and a horrendous regime. My daughter recently received a t-shirt with a picture of Princess Leia and the phrase “A Woman’s Place is in the Resistance”, and that image struck me as similar to the central image of this piece, a female member of the IRA in Belfast from the 1970s. 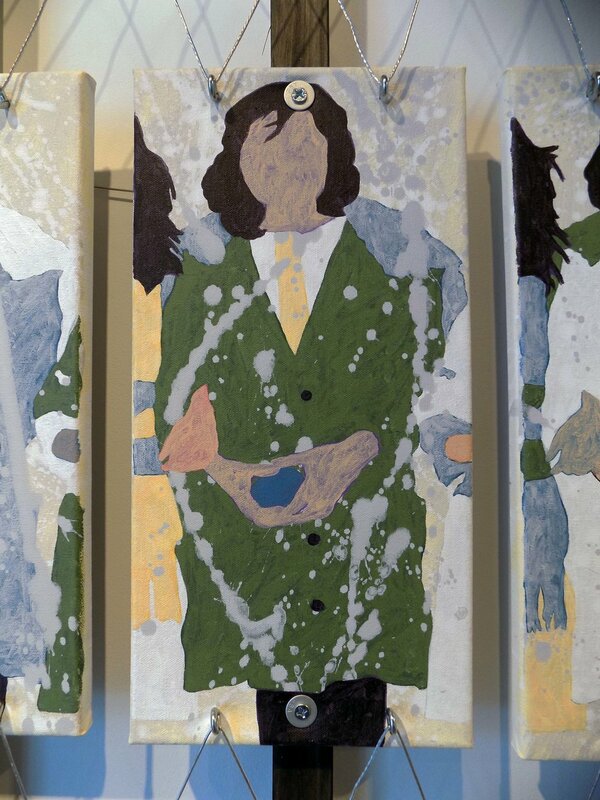 The treatment of the painted surface is intended to reference stained glass, an acknowledgment of the religious as well as secular nature of the conflict in Northern Ireland. Hanging in front of the central canvas are images of peace - angels holding wreaths - with quotes from James Joyce superimposed in front. The violence of the Troubles in Northern Ireland have thankfully given way to negotiated peace between the British and the Irish people, and to a clearer understanding and tolerance between the Protestants and Catholics in Irish society. Pub is a moment in time, a snapshot of two men engaged in conversation. The pub is an integral facet of Irish society, a place to meet friends and hear music. 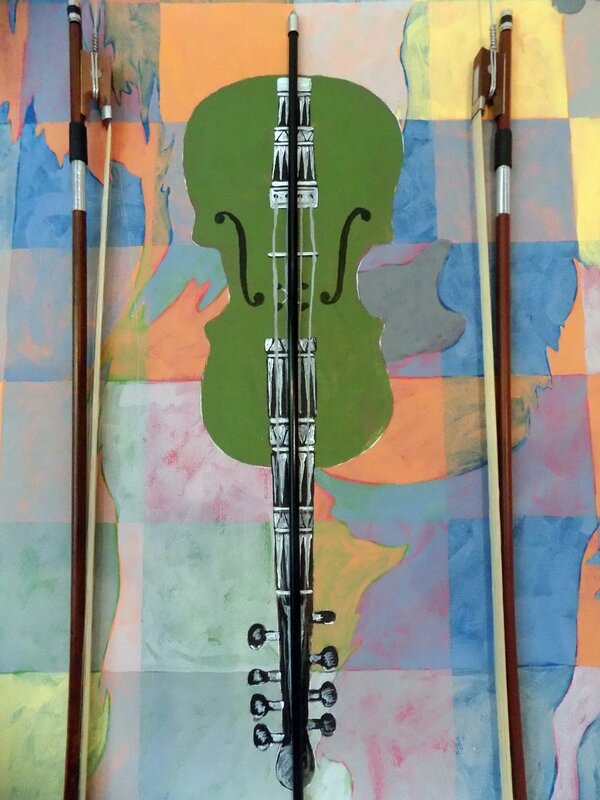 The Irish Tin Whistles stitched to the front of the canvas, seen through three of the glass panes, is in honor of the important place that music plays in the Irish pub culture, and in traditional Irish society as a whole. The window provides an intimate glimpse into the conversation, and frames the friendship of the two men. Remedy is a piece about the displaced and dispossessed in America, and the support, or lack there of for them. As homelessness and addiction continue to perpetually plague American society, the safety net that we build is constantly being stretched thin, torn apart, or discarded completely, especially in today’s political climate. It feels, at times, the solutions to real and serious problem are little more than panaceas and worry dolls. I wanted to depict this state of affairs in the piece, but also to show that at heart, within, there is joy to be found and nurtured. No person need be a lost cause, there can be a way to help those that need it most, but the solutions, although not easy, need to be developed and pursued, not discarded because the political climate will allow it. 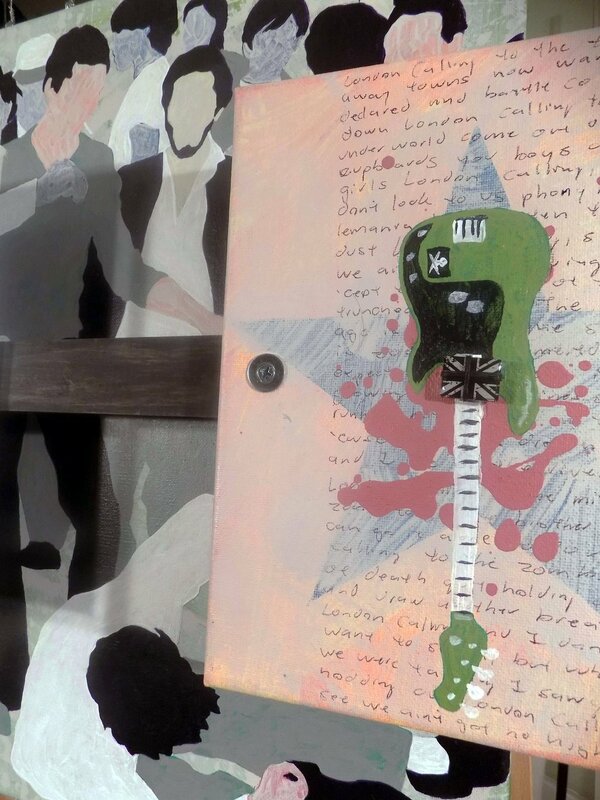 Non-conformist was originally a study for the larger work of art, to work out some the formatting and aesthetic issues of the piece, but was so successful. that it developed into a fully formed piece of it’s own. It is a study about people who go their own way. The imagery in this study focuses on those individuals who choose to remove themselves from the crowd, remove themselves from societal norms, and who shout into the din of conformity. 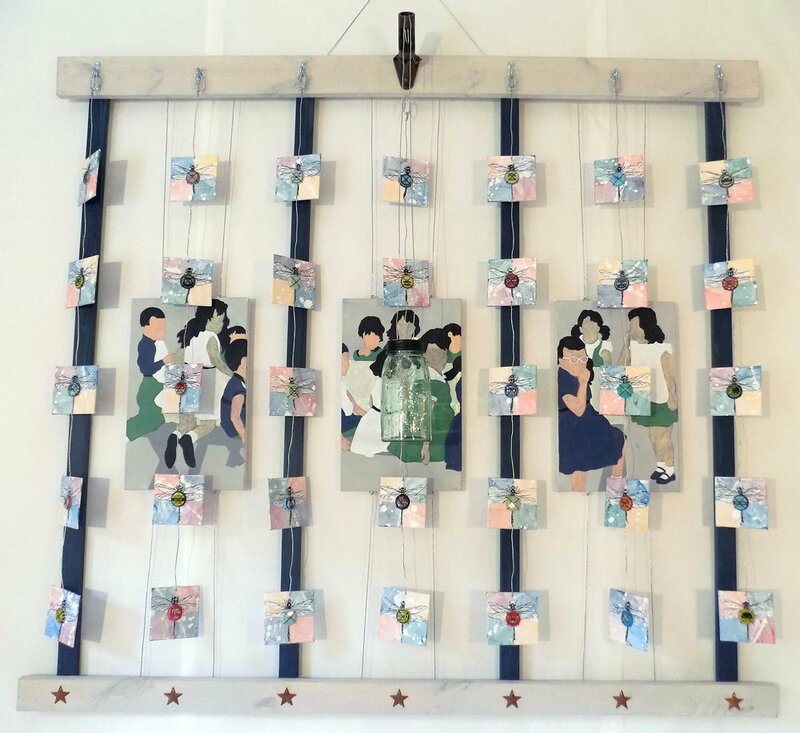 This piece was inspired by a girl who is among the crowd of children in a piece called “Fence” that I created about immigrants on Ellis Island. A face in the crowd, she reminded me of my daughter, and became a sort of personalization of the immigrant story for myself. A quiet piece, with muted colors and a simple subject, this piece is intended to be more of a contemplation than a narrative work. Although the repeated imagery represents for me the commonality of the children seeking refuge in this country, this piece is really a contemplation of this fathers’ love for his daughter. 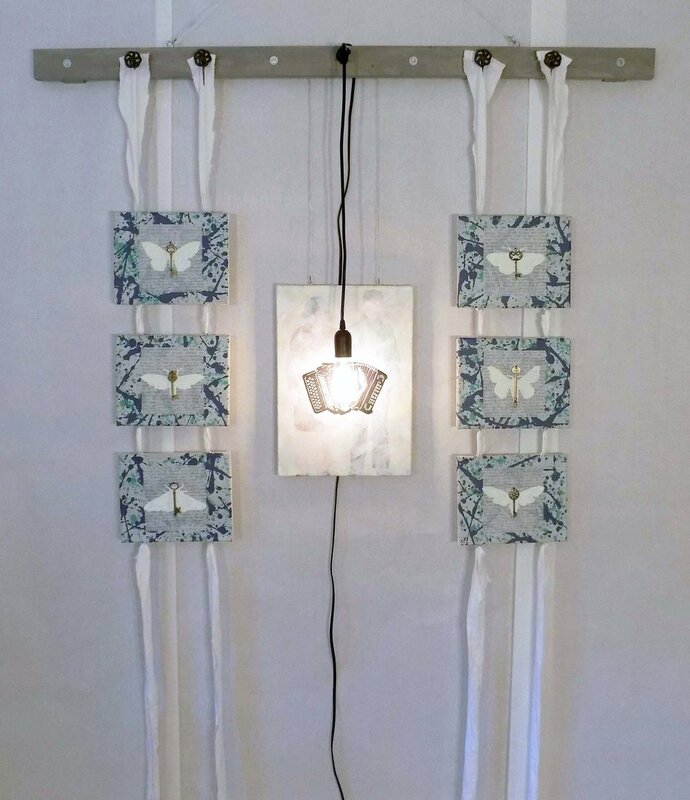 I originally created Hive a few years back as a free-standing floor piece, but over time it’s tendency to fall over, coupled with my desire to add a light element to the piece, persuaded me to convert it to a work of art that can hang on a wall. 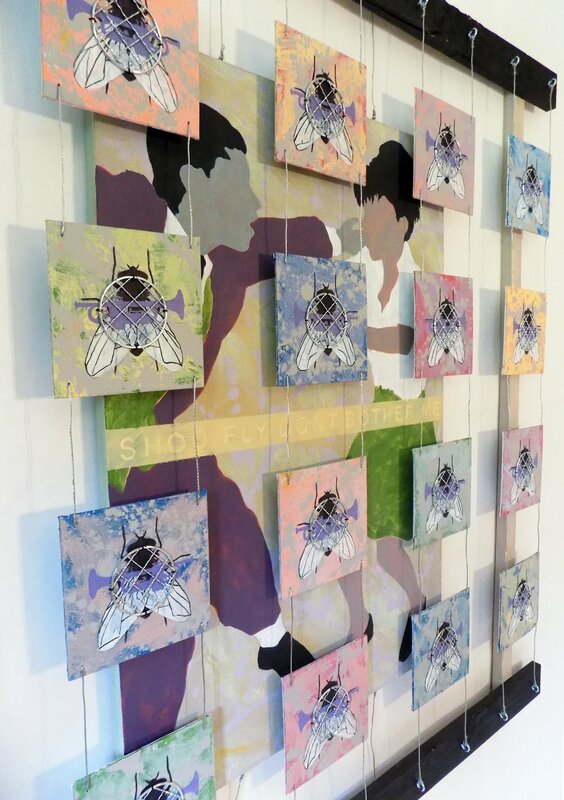 It is an abstraction of a hive, and the bee image is something that I constantly return to, as I find them both fascinating and a little bit frightening. Highland Cow is a piece about Scotland, the land of my ancestors. I wanted to create an image representing the Scottish Highlands, known for it’s wild, barren hills, as well as it’s wild, slightly barbarous past. It’s a big land, so I wanted a big cow, and so the image is life-size. 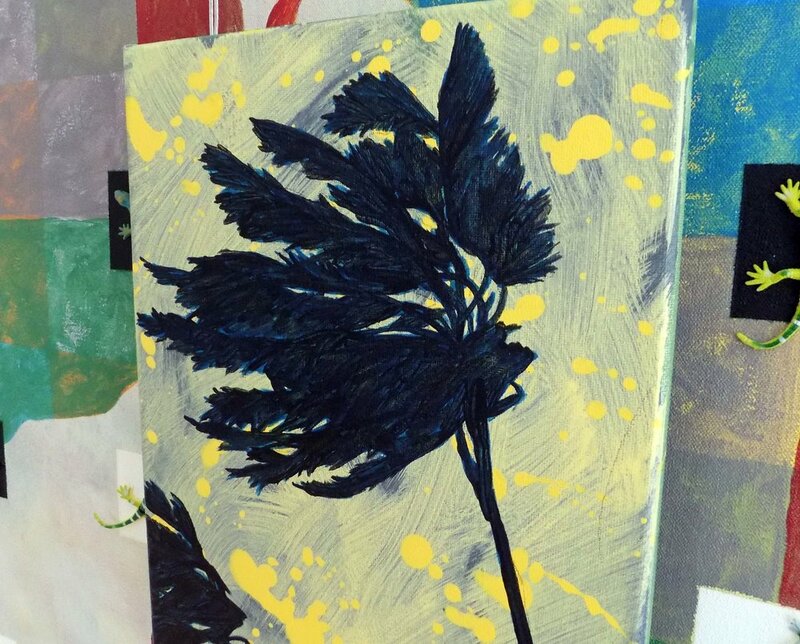 The colors in the background are reminiscent of the heather and wild grasses that cover the landscape. The history of the place is represented by the central image of the Scottish fiddle, as well as the bows and arrows. Summertime is a whimsical nostalgic piece about childhood summers. Dragonflies and soda caps danglevmobile-like in front of a triptych of canvasses depicting a child’s summer birthday picnic from the 1950s. Suspended in front of the central canvas from a flag pole bracket is a mason jar, commonly used to collect fireflies on a warm July evening. Lately I’ve been thinking about how to incorporate printmaking into my mixed-media pieces, so reached back 30 years to a lithograph that I created in college named “Revolution”, about the French Neoclassical painter Jacques-Louis David. David was sort of a hero of mine, in an art history nerdy sort of way, as he came to prominence at the end of the French Monarchy and then remained artistically in the center of French life through the French Revolution and the reign of Napoleon. Although ultimately exiled after the fall of Napoleon, he served as a moral light and ideological chronicler of his times, and this piece serves as a sort of homage to his place in history. 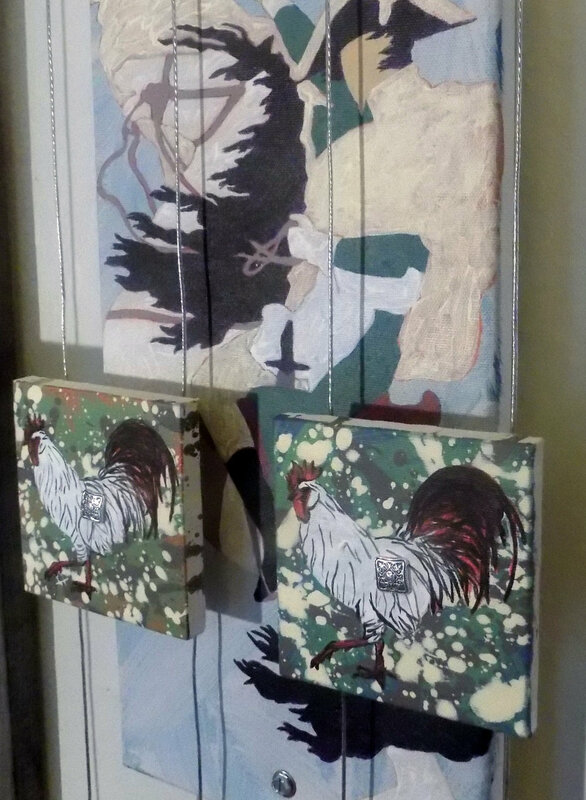 Napoleon Bees and Roosters Napoleon are companion pieces to the larger piece David, all about Napoleon and the French Revolution. 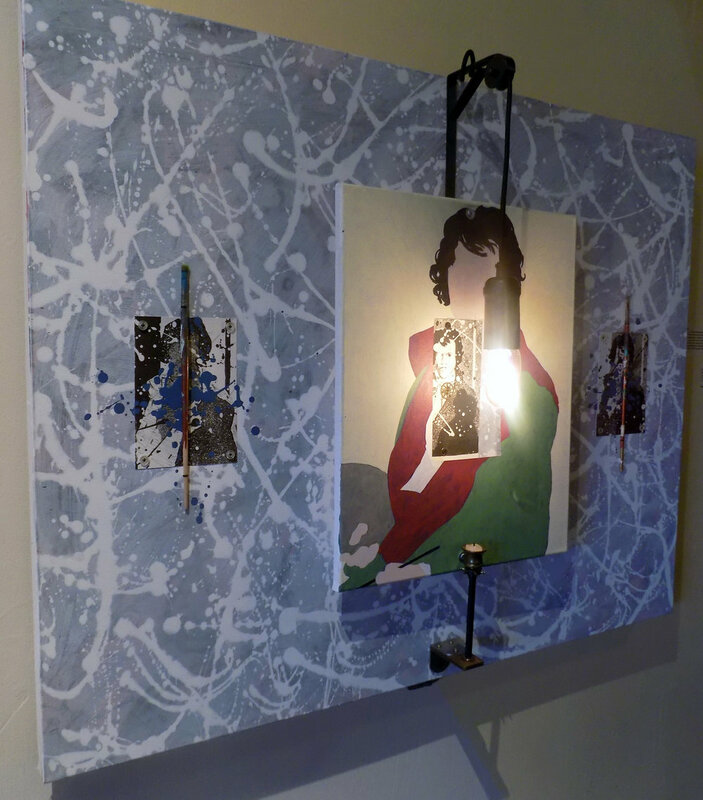 Both pieces are acrylic on canvas, pine frame, steel hardware, wire and silver buttons. I wanted to create a work about the cultural diversity of America with Flag, but also about how, in our current time, the nature of being an American also represents a loss of personal identity – the sacrifice of self for the whole, whether it is desired by the individual, or not. 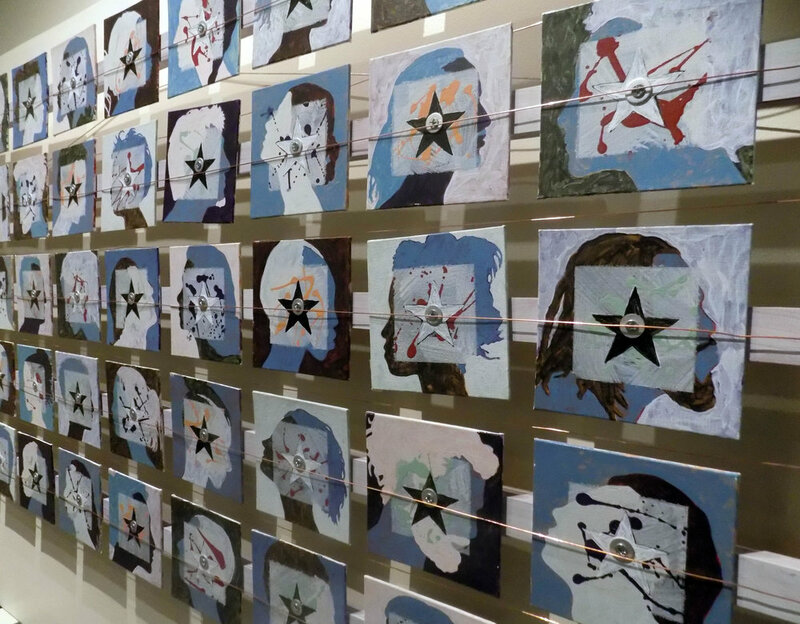 To this extent, the various portraits of people are superimposed by the stars, and each individual is bolted to the overall frame of the flag. Copper wire is stretched in front and between the portraits, representative of the stripes on the American flag, but also hinting at the loss of individuality inherent in the binding of a nation. While diversity is celebrated in our shared history and ideals, the reality of today’s America often means that being different from the majority is not rewarded, often punished, and a significantly more difficult road to take. American Alligator is a piece about Louisiana, and a meditation about how the great Mississippi bayous, and our wilder natures, have barely been tamed. 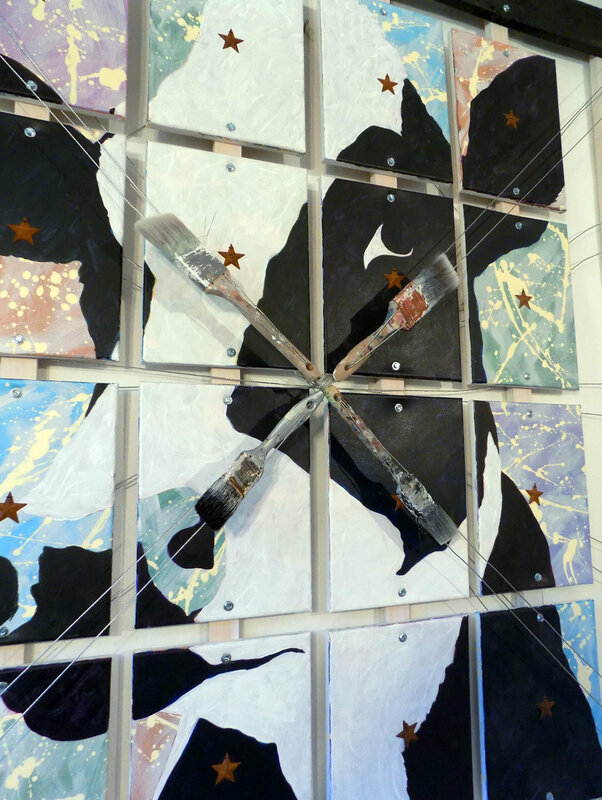 The life size alligator lies before a canvas gridded with black thread and stars, meant to symbolize the net of order thrown across an untamed wilderness by modern civilization. String dolls, often associated with voodoo rituals, are stitched to the canvas over small lizards, and a typical bayou house lies in the middle, circled by the alligator. The trouble light that is suspended in front brings light and clarity to the center of the piece, while being surrounded by all that is wild. Glasgow is the urban piece of the two pieces about Scotland. The main image is of schoolchildren in the slums of Glasgow in the 1930s. 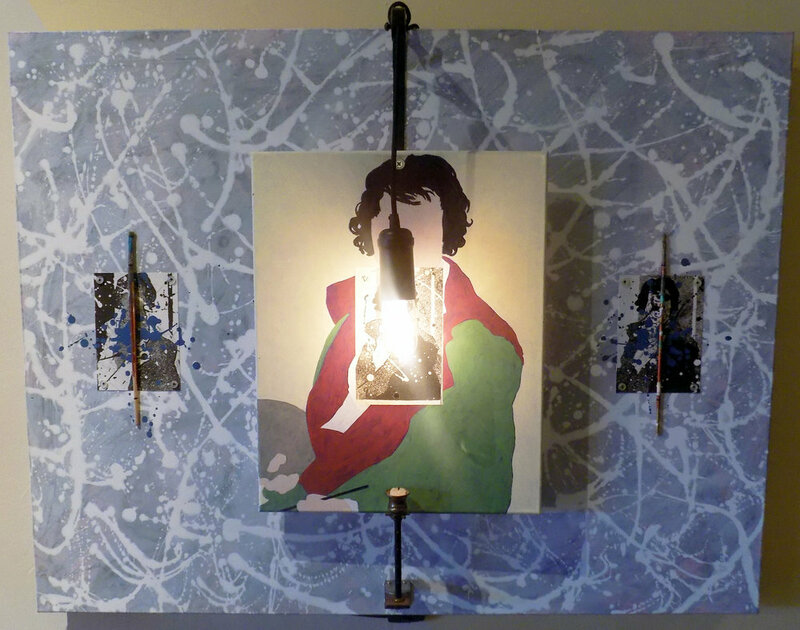 The 4 canvasses suspended in front of the main canvas by iron schoolhouse coat hooks is of a tradition gas lamp lighter, superimposed over quotes from poems by Robert Burns, Scotland’s most famous and treasured poet. The children in the slums of Glasgow lived in abject poverty, and one of the few keys of escape was education. 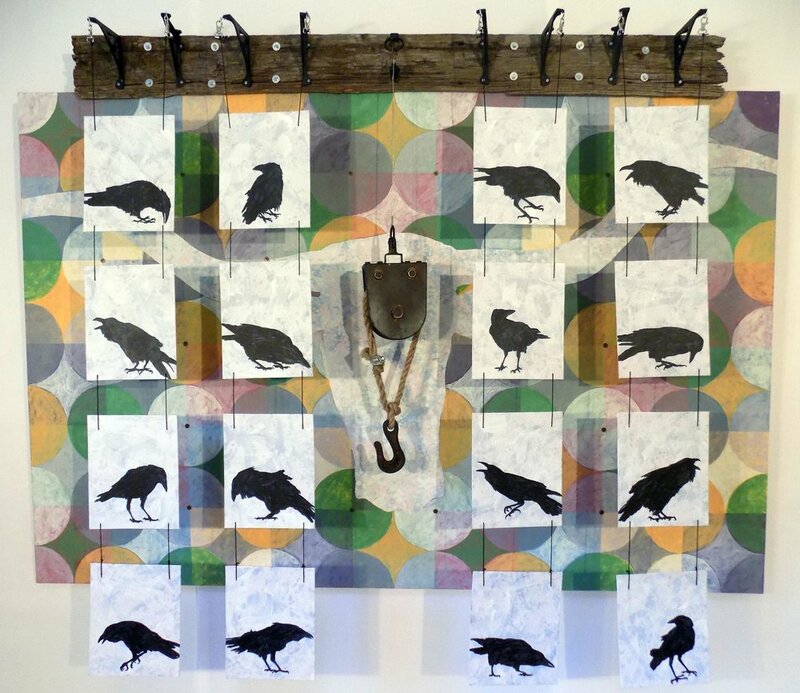 This piece is meant as a big thank you to the town of Lynden, which hosted to concurrent shows of my work at both the Jansen Art Center and the Beautiful Inn at Lynden. 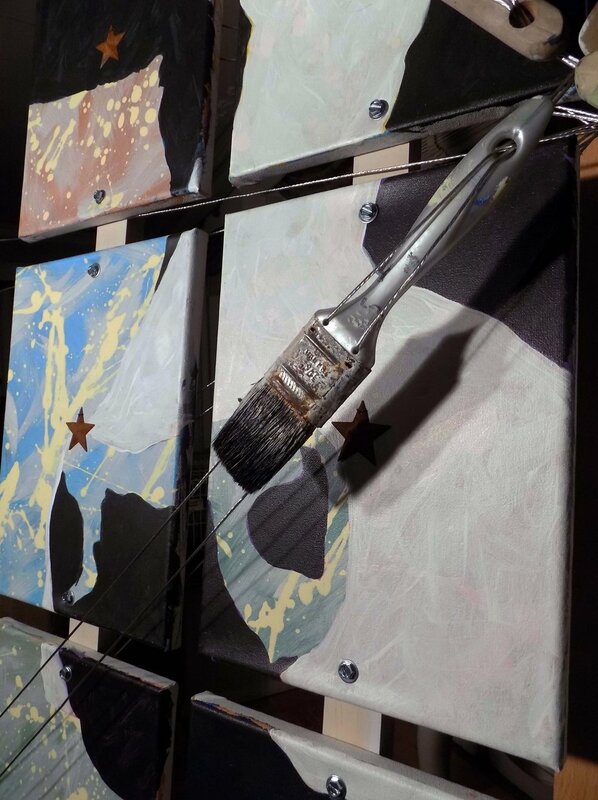 Acrylic on Canvas, pine frame, tin stars, faucet handles, wire and paint brushes. The three pieces in the Cure For What Ails You series are a unique nostalgic work of art about music and culture in southern Louisiana. The dancing couple is superimposed with an oral history from the music clubs of New Orleans from the 30s and 40s, and the glass bottles that hang in front reference the dual cures of apothecary and voodoo. In a time of systematic racism, a musical tradition of identity and inclusion blossomed and flourished in the clubs and halls of the city. The three pieces in the Cure For What Ails You series served as studies for the larger Remedy work, focusing in this instance on the mysterious power of music, dance and joy. Acrylic on canvas, wire, cotton thread, glass vials, worry dolls and pins. This last spring we experience a mysterious plague of flies at our house, and I conceived of a piece called Plague of Flies. While developing the ideas it occurred to me that nobody really wants to see a piece of artwork about house flies, so decided to scrap the idea. 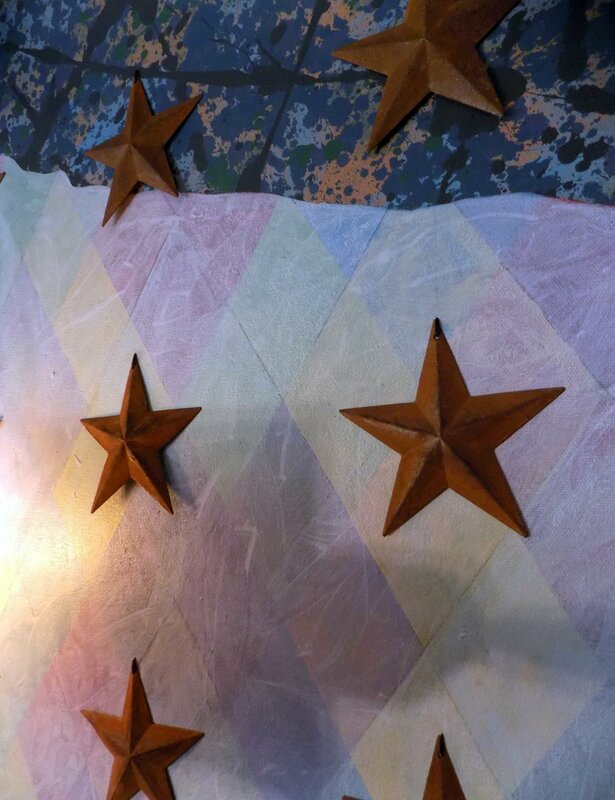 Still, the great New Orleans Mardi Gras song “Shoo Fly” kept throbbing in my head, and I decided that I needed to change tacks, keep the flies, but focus on the song. 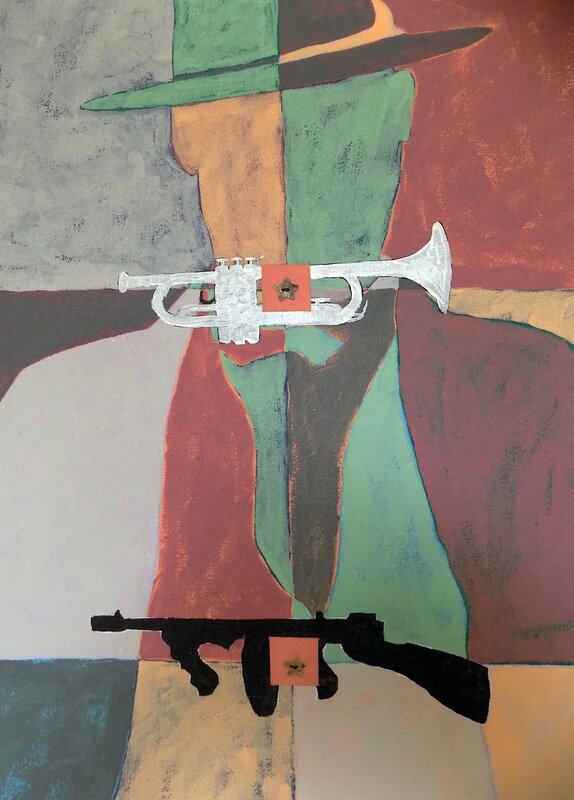 The repeated imagery of the flies, with the trumpets and frog lids stitched on top, are meant to echo the great repeated call and response of the song, always the same, but always a little different. Porch is a nostalgic piece about rural Louisiana, one of my favorite places. 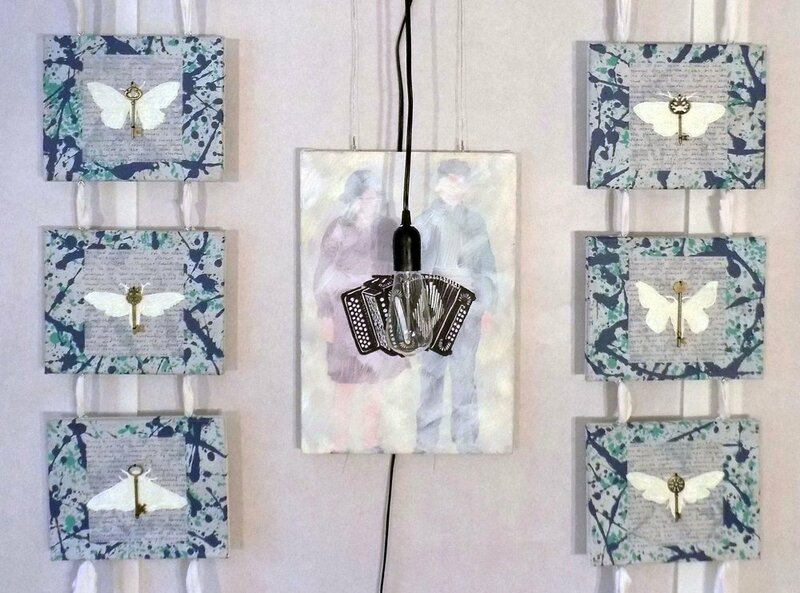 The six suspended canvasses depicting various moths features fragments from Hawthorn’s epic poem “Evangeline”, about the migration of the Acadians to Louisiana. 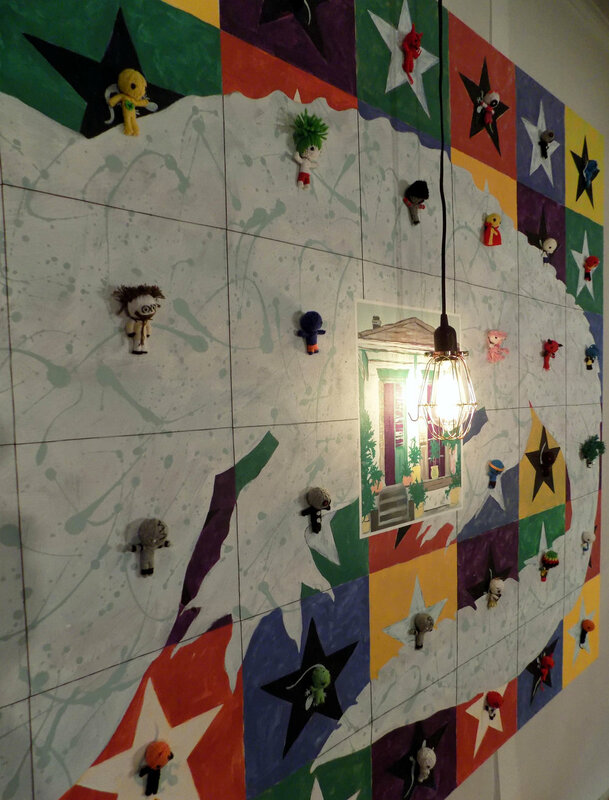 The central canvas depicts an image of two of the cajun children, washed out with time, superimposed by an image of an accordion and an old-style Edison bulb. 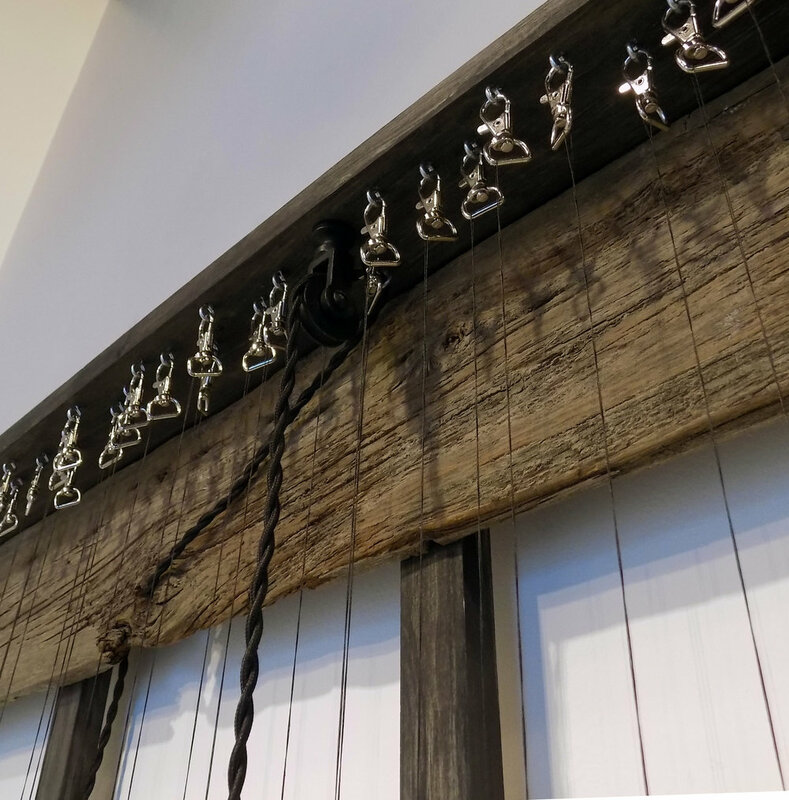 The construction of this piece, complete with the torn cloth and handing wire, is meant to evoke a cabin on the bayou, nearly forgotten but seemingly timeless. I wanted to do a piece about pirates for my kids, with all of the great imagery that comes with it, but when I started developing the piece I kept removing color from the palate until it became a primarily white and grey work of art, thus a ghost ship. The pennies that are attached to the piece were pounded flat until all definition was removed, and then bathed in a mixture of salt and vinegar, so that they will oxidize and turn black during the lifetime of the piece. 1977 is a personally nostalgic piece to me, about the British Punk Rock music of the late 70s and early 80s that I grew up listening to in my teens and 20s. The central image is of the Notting Hill riots that took place in London in 1977, inspiring the song by the Clash, as well as their name, and is representative of the economic and racial discord of the UK that gave rise to the anger of the early punk movement in Great Britain. I wanted to get a feel for the chaos of the time, but also how it spawned a music that channeled the anger into something tangible and meaningful, with a dynamic frustration and, at times, a seething political and social awareness that inspired a dumb kid all the way in Seattle to think about life around him and how to make it better. Speakeasy came about whole investigating the jazz age in the 1920s. There is such a strong set of images that come to mind when thinking of the time, from gangsters to band leaders, from flappers to tommy guns. Jazz was born in this time, and became the sound of all that was illicit, illegal and exciting of these legendary underground clubs. 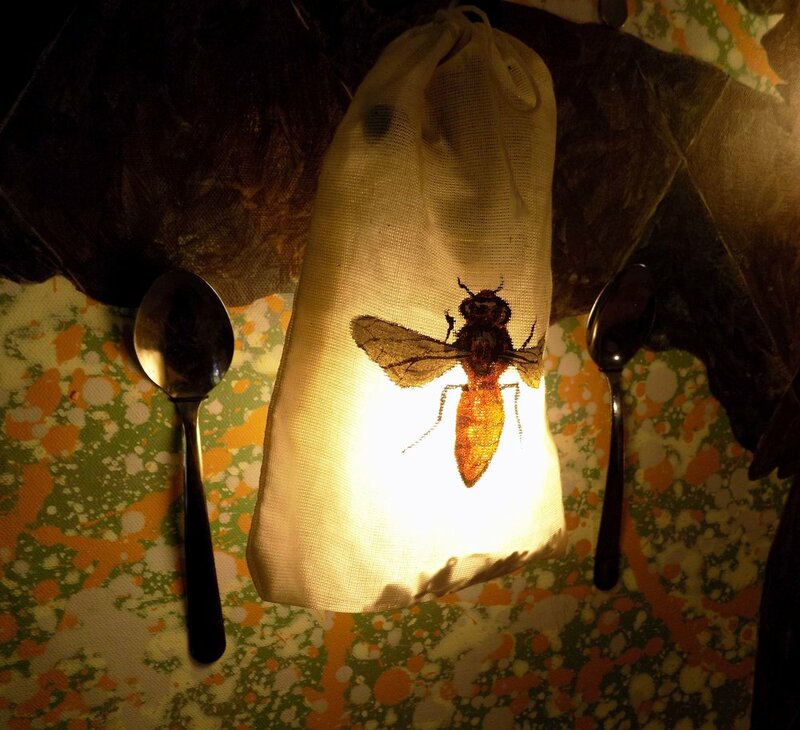 Queen Bee was inspired by the shape and color of the lightbulb that hangs in front of the piece, and was the first wall piece to feature light. I have long been intrigued by the idea of bringing light into my artwork, and traditionally have used it as backlighting for my floor pieces, but this time wanted to feature it front and center. The beauty of the bulb, and the wonderful color of the light, enhances and gives life to the great queen bee that lies behind. While working on a piece about British Punk Rock from the late 70s, and my misspent youth listening to it, I became somewhat surprisingly nostalgic for the Cold War. It seems to me that, unlike now, we always knew who the enemy was supposed to be, and that they would most likely never actually send any nuclear weapons our way. The Cold war may not have been a particularly fun time in our history, but there is now a certain romanticism associated with the espionage and spy games. While developing Cold War Romance, and thinking of imagery from that time, I wanted to stay away from missiles, bomb shelters, and all of the usual trappings of the cold war. I decided on a lighter piece, featuring the romantic couples from both sides featured, and rusted stars stitched over the top. A personally nostalgic piece that was generated by a visit to the Museum of Flight. 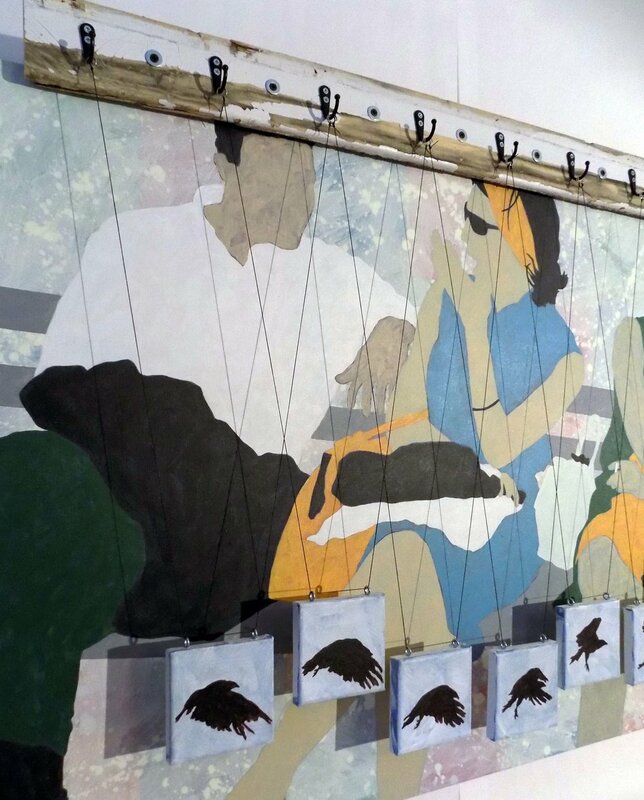 I was inspired by the planes suspended from the ceiling at the museum to create a mobile of plane paintings that would hang free. The spoons attached to the piece are in reference to the first thing that my wife and I ever bought together for our newly moved-in home, a wind chime constructed of bent spoons (which we still have). 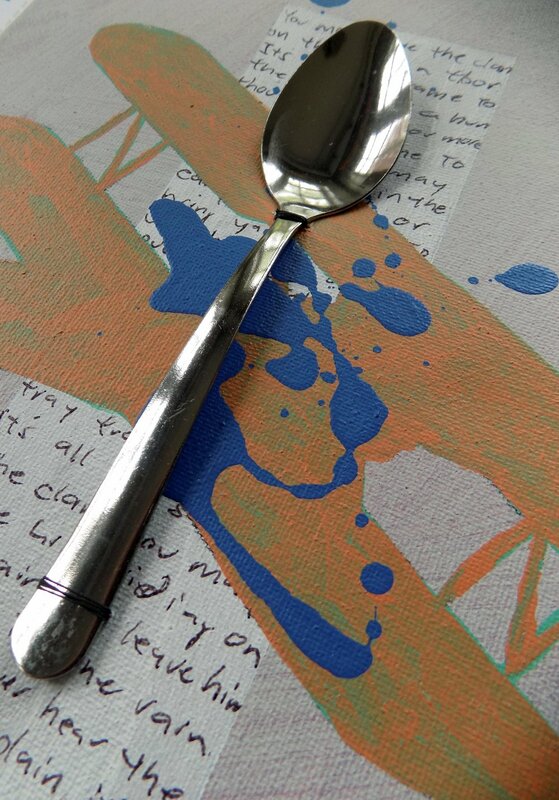 The writing behind the planes and spoons are snippets of prose from all of my favorite children’s books that my children will not longer let me read to them. Windstorm is based on the November 2015 windstorm in Spokane that knocked out our power for a week during one of the worst cold spells of the year. The chaos of the storm and the following debris were offset by the absolute darkness and complete calm the following day. I tried to capture these two disparate senses in the piece, while also echoing the darkened windows with the candles for light and tree branches strewn in front. It was a terrible and wonderful storm that my children will remember possibly their entire lives. Expression is a small take on the freedom of expression. The various portraits are stitched together with various buttons, each unique, as are the statements written across and the portraits themselves. The statements written on the canvas are often mundane, but the freedom to make them is a foundation of American society.